Hello cherished programmers it’s Andy Gesner and the HIP Video Promo staff, bringing you a hot new clip you don’t want to miss. Like most everyone else, we love a dance party, and the video for Human Life’s “In It Together” more than satiates a person’s appetite to just dance. But Human Life conjures up a dance party quite unlike any other – spiritual invitations and vibrantly colored body socks included. And with the energy of the song being described as the modern day take on “Travolta’s Saturday night strut,” we’re confident that you’ll be nothing less than electrified by this catchy new clip. The video for “In It Together” follows a young boy who receives an invitation covered with spiritual symbols. After hitting the play button on his turntable, he almost immediately recognizes his calling. His journey is prefaced with the quote, “Life ahead of the curve is pretty lonely” being written on his wall. What follows is the boy running through alleyways and streets, acquiring tribal-wear along the way. These are the necessary accessories for where he’s headed: a party where the crowd is wildly decked out in costume and, as the music pumps, everyone essentially becomes one. The visuals are beyond intriguing, and the song itself for “In It Together” can only be described as the next instant club hit. 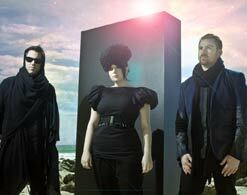 Human Life is without a doubt the next breaking electro pop and indie dance group. Comparisons to electronic sensations like Daft Punk are almost inevitable, but these LA-based house music veterans respect those influences and take their tunes to a whole other level. Already popular in France, Human Life has tons of international flare and a unique style that implements subtle lyrics but loads of attitude, at the same time. And like we said, don’t be fooled by Human Life’s seemingly new appearance on the scene. The trio – consisting of musicians Joshua Collins, Matt Wasley and Rachael Starr – have individually been producing and performing for a while but came together in the name of showing the more melodic side of the electro genre while mixing in pop vocals, killer songwriting and enthusiasm galore. “In It Together” is not necessarily Human Life’s first foray into taking on such a goal (their very first single together was the acclaimed “We Won’t Stop”), but it is their first song since helming their very own record label, LIFEX Recordings. It’s an impressive undertaking and is telling of the group themselves, who decided on the name Human Life because, according to Wasley, the “lyrics centered around the way human beings interact with each other and the world around us.” This idea is definitely carried out in “In It Together,” and we can’t wait to see what else Human Life has in store with the anticipation of their yet-to-be-titled EP this fall. We’re thrilled to be pioneering this breaking act who are decidedly making it their own way with their label LIFEX Recordings. We’ve got lots of copies of the “In It Together” single for your listening pleasure and on-air giveaway needs. If you need more info, call Andy Gesner at 732-613-1779 or e-mail us at HIPVideo@aol.com. You can also visitwww.HumanLifeMusic.com to find out more about Human Life.